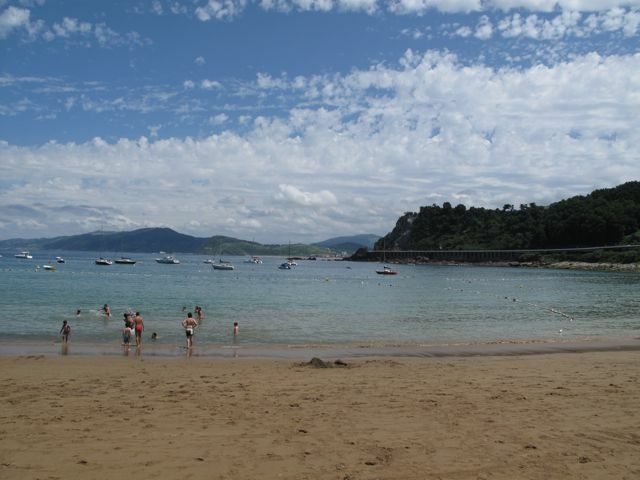 Getaria is a short, beautiful drive on the N-634 from San Sebastian/Donostia. Right away as we drove into town we knew we’d come to the right place. 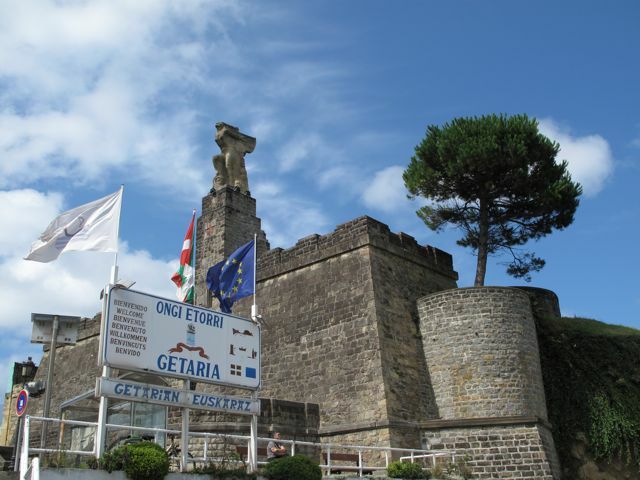 Visible from the coastal road you take into town is a storefront bearing the name of the controlled wine region Getaria-Txacolina–I was in heaven. I met a young woman there who gave me a map with the locations of all twenty-one wineries whose wines qualify for the Getaria-Txacolina designation. This is an incredibly small region, and these winemakers aren’t like those in California. There aren’t huge tasting rooms open seven days a week–these are mostly family-run businesses based out of people’s homes. These wineries typically only make Txacoli, which is a unique wine in and of itself–a young wine produced in limited quanities once a year, and meant to be drunk within the coming year. The woman secured a reservation for me that evening at Urki, a new operation, but one that produces incredibly heavenly Txacoli, and we were off to explore the town. 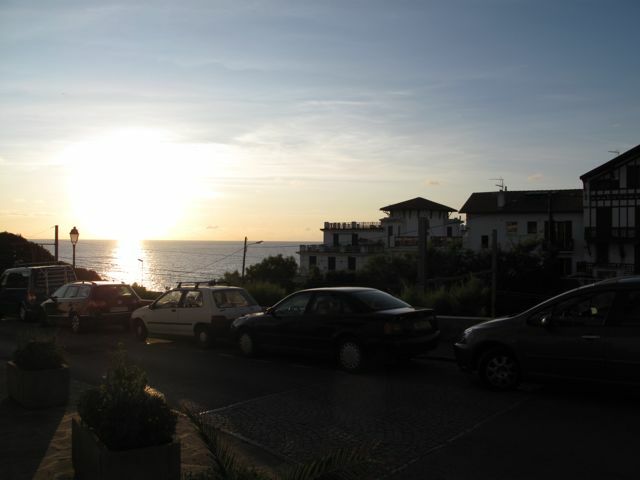 The picture above shows the main street of town, facing from the coastal highway towards the ocean beyond the church. The Church of San Salvador was originally erected in the fourteenth or fifteenth century over an even older temple, of which nothing remains. 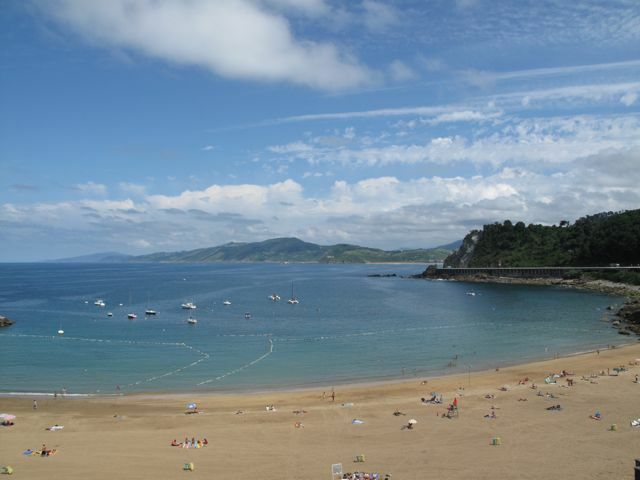 Getaria is a point of great archeological interest since it has been inhabited for centuries, and the street you see above has always been an important corridor used for defense from the inland to the sea. A small tunnel runs under the church still to this day, in order for townsmen of old to defend their homes from seaside invadors. After some pixtos (or tapas) from one of the bars (I think that one with the red awning in the picture) we decided to hit the beach. It was a truly picturesque afternoon. 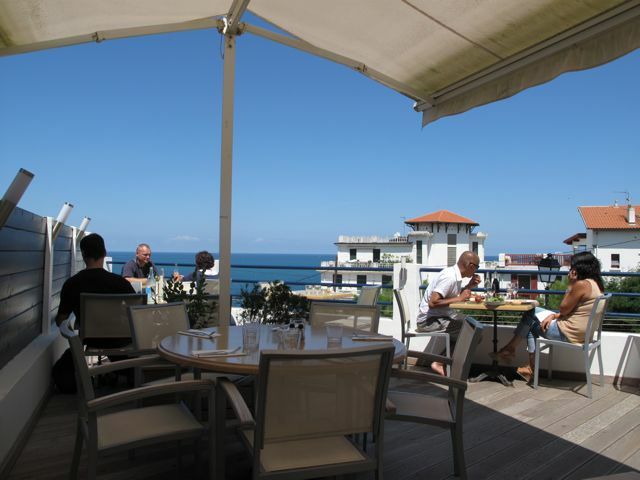 I took a dip, laid in the sun a bit, and when I got too hot, I retreated to a beach cafe and had a bit of Txacoli. Entering Getaria and the Monument to Juan Sebastian Elcano (J.S.E. was the first man to sail around the globe. This monument was erected in the 20s after the Winged Victory of Samothrace). 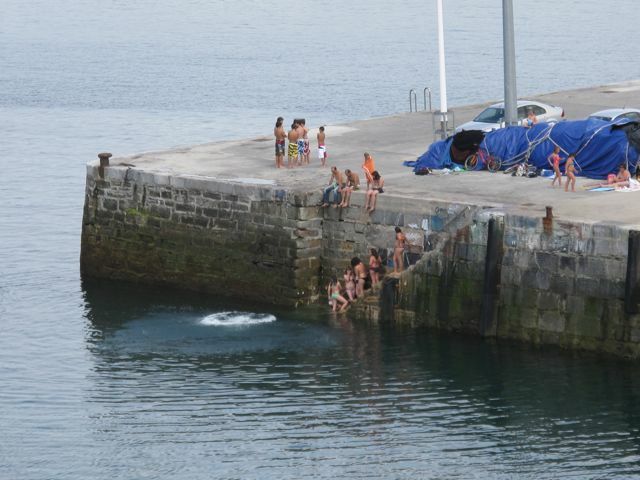 Getarian children jumping from the port into the bay! Next up, a report on my visit to Urki winery. You might start to notice that I’m working backwards now, which is slightly awkward, but I’ll make do. I’m finding it less awkward than starting from the day I stopped blogging and working forward. I hope you’ll stick with me on this strange anti-chronological journey. 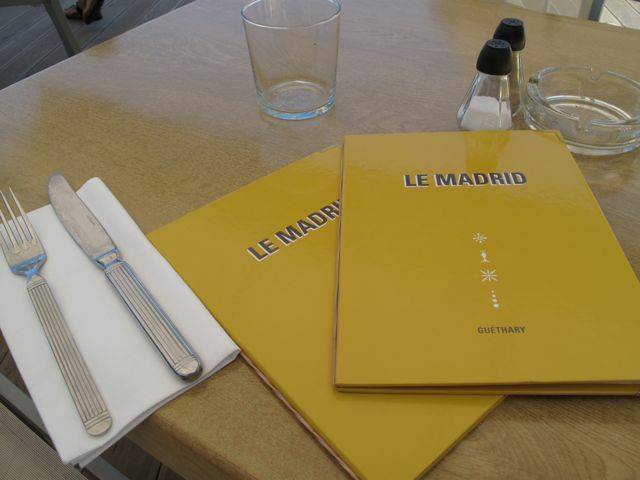 Le Madrid was the unofficial (official?) hang of our stay in Guéthary. Our first two days in Guéthary it was closed for two days before officially opening for the summer season, but Le Madrid was all I heard about for those two days from our Parisian friends and hosts. 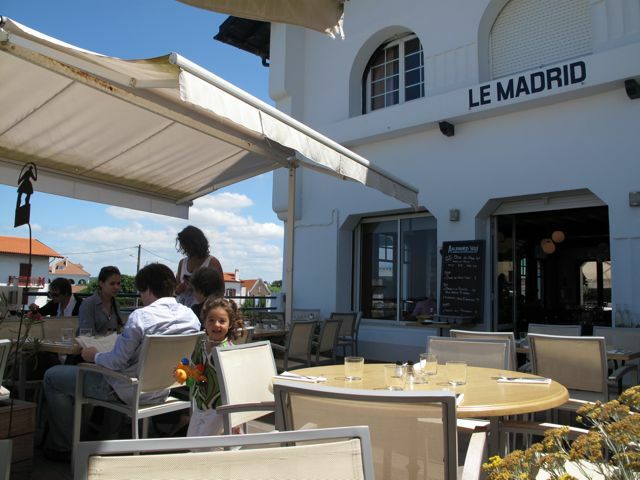 It was so inflated as a “spot” that it hardly occured to me that the food would be any good. When I ate dinner there for the first time on the night of the 8th I was absolutely blown away (some of you might remember a tweet of mine about the Cote de Beouf melting in my mouth). Those kind of dinners aren’t for stopping every few minutes to photograph. We were among friends, telling love stories, and sharing wine and Cote de Beouf (with Bearnaise of course), and since the best parts of the ephemeral meal were only captured in memory, I pledged to return in a more alert state so that I might record some of my meal for ARL. So, that said, on to lunch. It is worth explaining that I. and I fell in love with the menus as pieces of art in and of themselves. We loved the fonts, the illustrations, and the color. 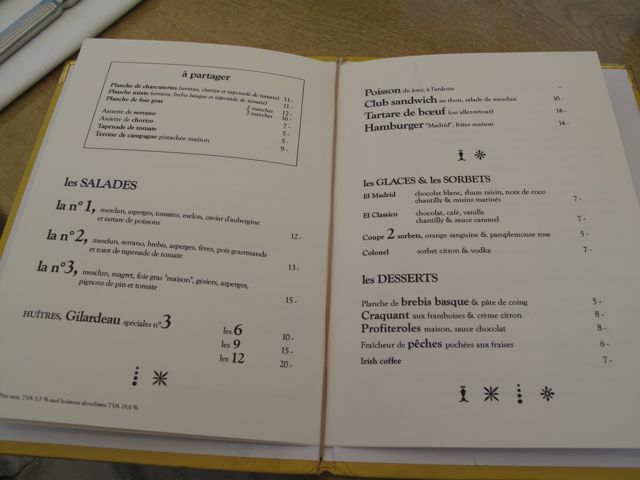 When we mentioned this to our friends they explained that the menus are designed by Martine, one of the owners, who was a graphic designer before she was a restaurateur. The perfect lunch. The oil for drizzling has parsley and tarragon, the cherry tomatoes are roasted, and the pasta has a crisp piece of bacon artfully arranged at an angle atop. And, how is it that the French know how to salt meat so perfectly? 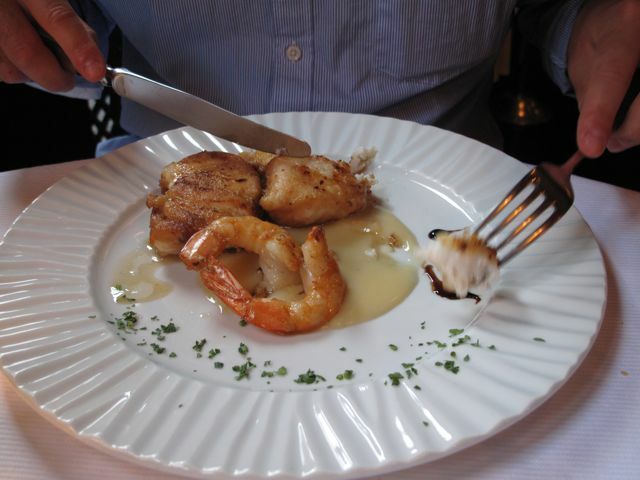 You can see the small crystals of sel de mer on the maigre here. Delicious. Now that we’re in Spain it seems impossible, but I am actually missing Le Madrid. If you are in the area go, sit for a few hours. 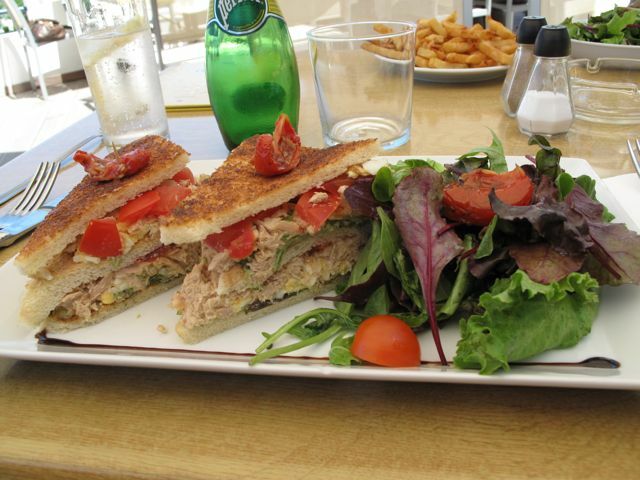 People watch, imbibe, and go back a few times to sample a variety of what’s on the menu. You won’t be disappointed. Of course between Paris, Marseille, Lourmarin, Guéthary, and Hondarribia (Hondarribia is the Basque, but the town is also known as Fuenterrabía in Spanish and Fontarabie in French), much is missing from my typically daily entries here. That noted, we are very happy to be in Spain. This part of Europe is especially striking due to the stark constrast in food, language, and terrain found just across the border from one country to another. 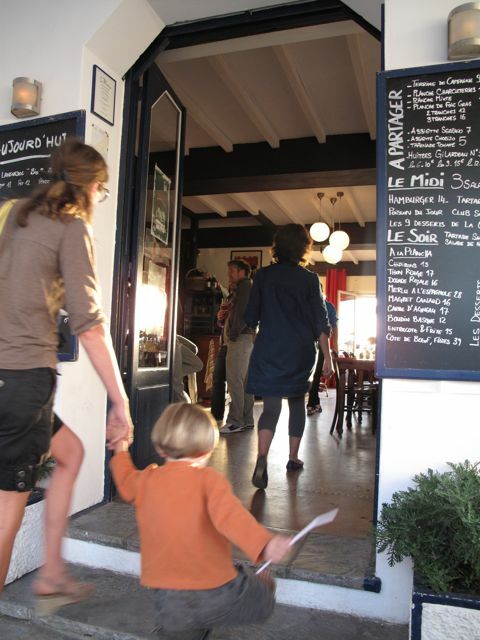 A twenty or thirty minute drive from Biarritz and we’re in a whole other world. 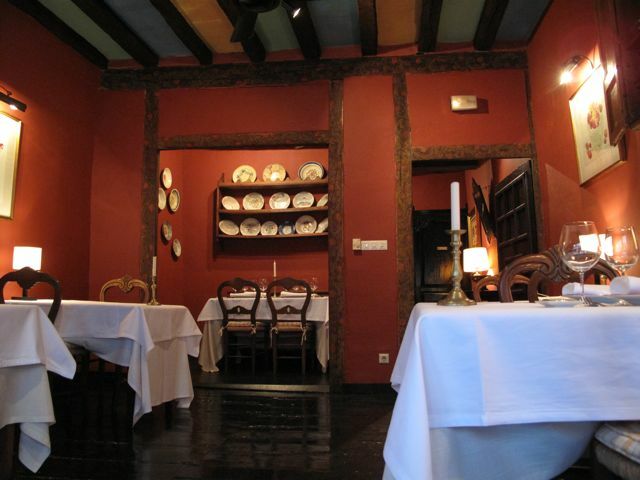 We landed in Hondarribia, in the old quarter of town at an amazing hotel called Obispo, housed in what was a 15th century palace. I love this place. It’s charming–old yet comfortable, and impeccably kept including all the amenities a modern girl could want (WiFi! while it was fun to be liberated, it is fun to reconnect too). We arrived slightly exhausted from all the fun we had with our friends, the vacationing Parisians, in Guéthary (is it possible to have too much fun?) so we did the unthinkable and sat down to dinner at 8:30 (does it count that it hasn’t been before 10PM or finished before 12AM for the last week?). The Hotel Obispo recommended Sebastián, which happens to be just around the corner (no walk or drive to the new part of town necessary). It looks beautiful from the outside, so it wasn’t hard to draw us in. 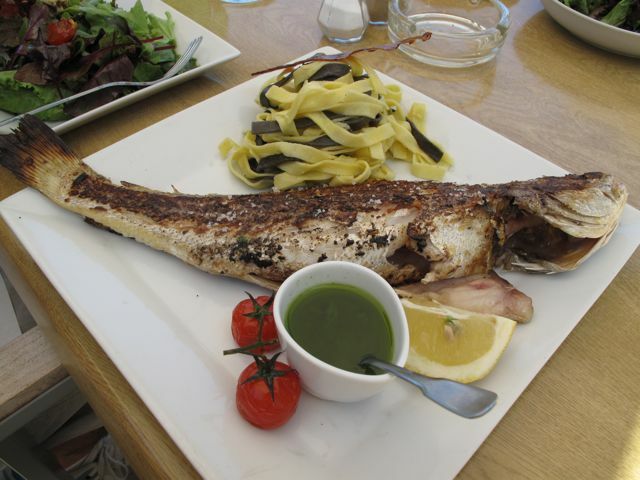 Here is our meal in pictures and a few words (I was too relaxed to remember to take any establishing shots, but the restaurant’s website has a good virtual tour and great historical photographs too). 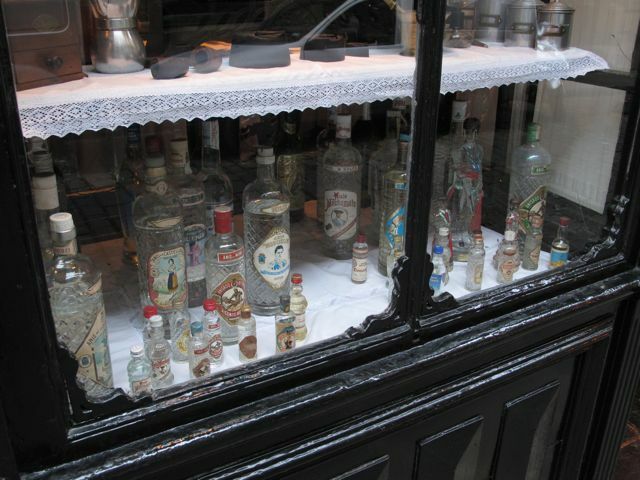 The restaurant’s website states that “[the space] was a grocery shop several centuries ago [and] the most representative elements of the shop are still conserved, such as the window displays and glass cases once displaying the groceries which supplied numerous generations of residents of Hondarribia.” Here are various bottles (age unknown) in the window display case. We ate upstairs. 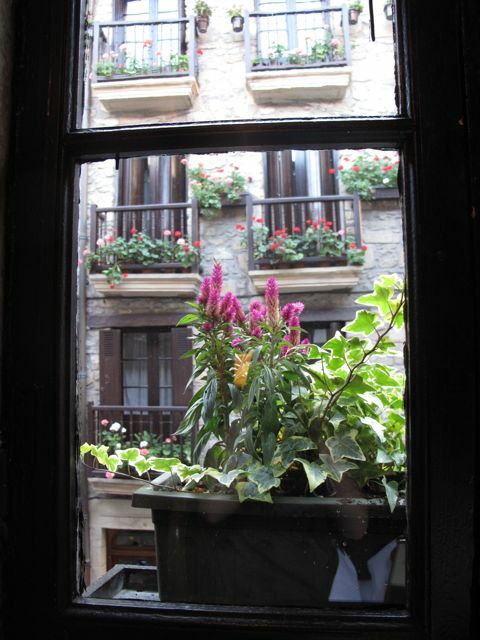 This was our view; a window box planted with purple amaranth and ivy. Across the street are window boxes with red and white geraniums. The upstairs dining area. Note that we are among the first present for dinner…there was one other couple across from us. The benefit of the early hour is great photographs. I loved the alternating colors between the beams on the ceiling. Only a Spanish chef/restaranteur could pull that off. Honestly. 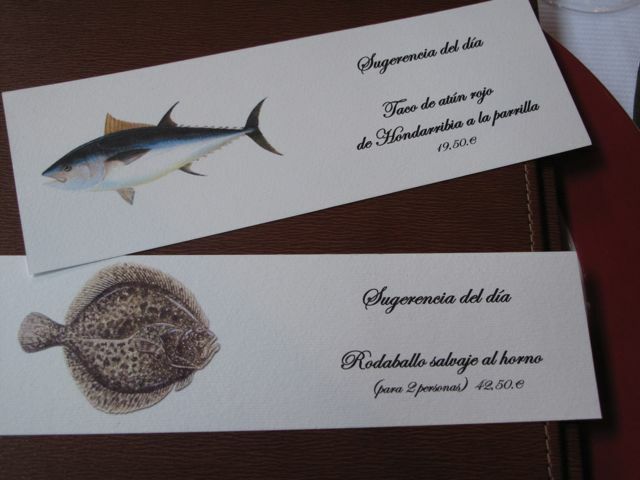 These are the beautiful cards containing the chef’s suggestions for the evening. Qué bonita! Las ilustraciones sólo! 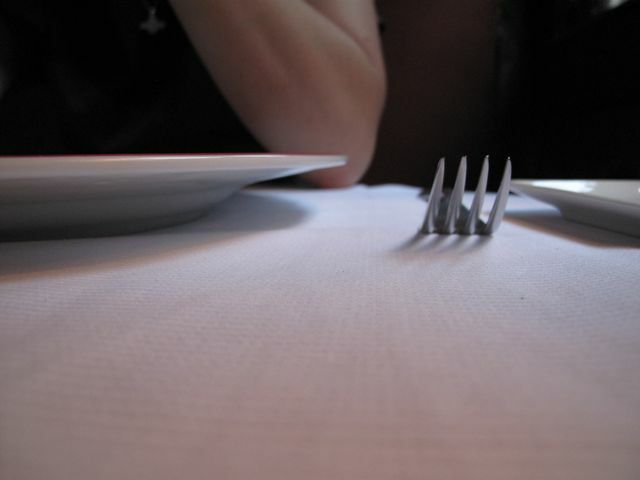 An essential component of any fine dining experience: fine linens for the table. I found Sebastián’s particularly soothing due to a delicate pique. Txacoli: it has become as essential to my existence as Almodóvar. Sin txacoli lo que es la vida? These tall cups (unlike the shorter versions I am used to drinking Spanish wine in) are very cool. It is like drinking liquid ambrosia, the liquid of life. 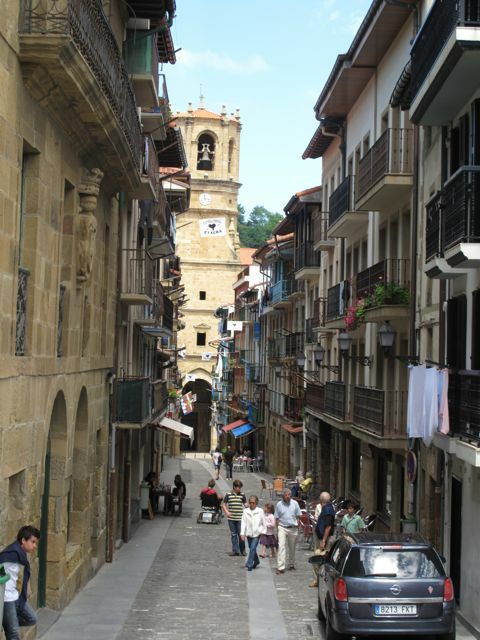 The wine is produced in the countryside outisde of Hondarribia. 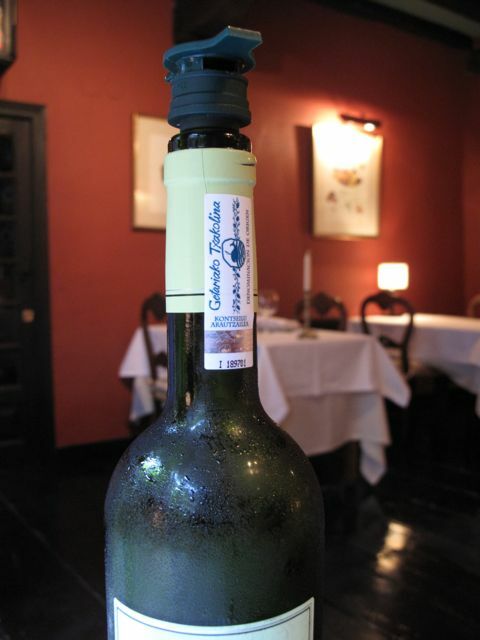 Don’t be fooled by any imitations; the “Getariako Txacolina” sticker across the foil is as essential as any Bordeaux A.O.C. 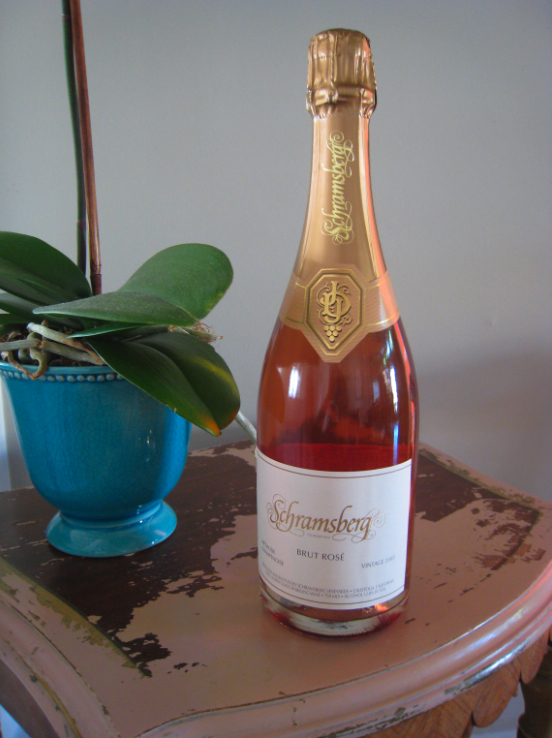 It is an extremely limited area in which these special grapes are grown, and the special wine produced. 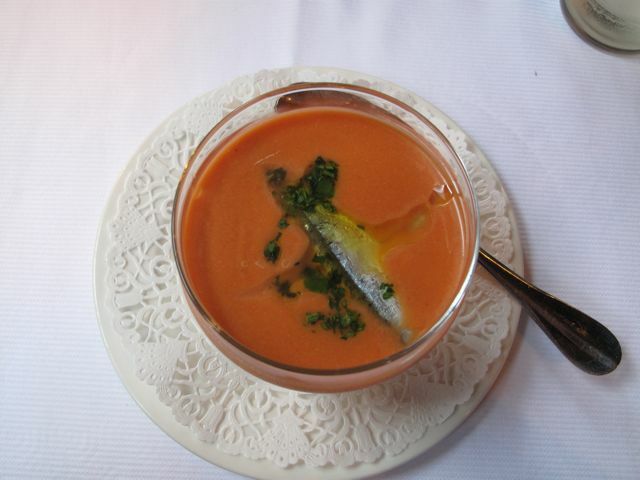 The “taco de atun rojo de Hondarribia a la parilla.” With my limited Spanish I have little clue what I ate (sorry). I half expected some tuna in a corn tortilla. Wrong. What came was 1,000 times better. 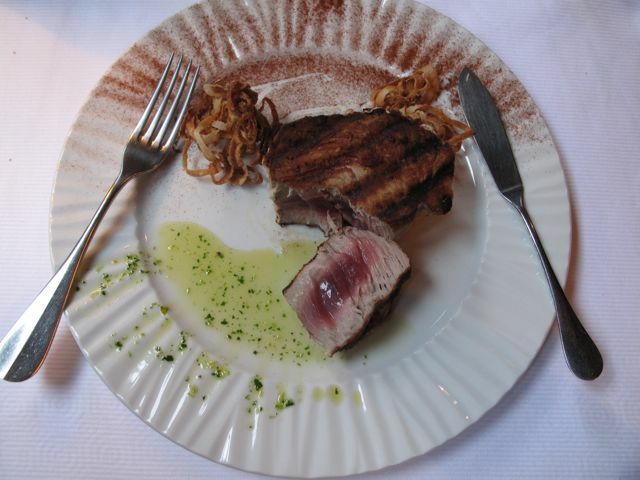 It tasted like the most beautiful tuna steak seared in a deep seasoned pan of pork fat–there was surely a strong bacon-ish element that was delicious. On the side are some crispy onions and a drizzle of parsely-seasoned olive oil. Amazing. 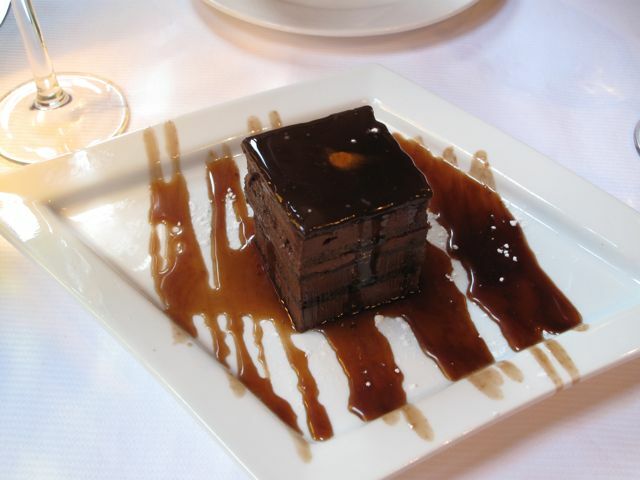 I can’t be sure because I forgot to photograph the menu, but I am fairly certain that this dessert was advertised as the “chocolate brick.” It delivered as advertised. Overall an extremely successful first night in Spain. 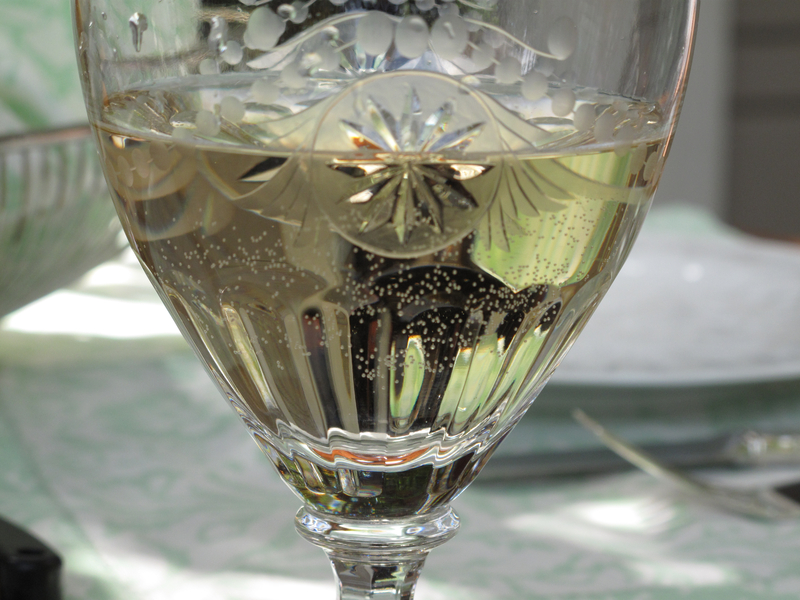 We will indubitably return to Sebastián–did I mention the service is impeccable? 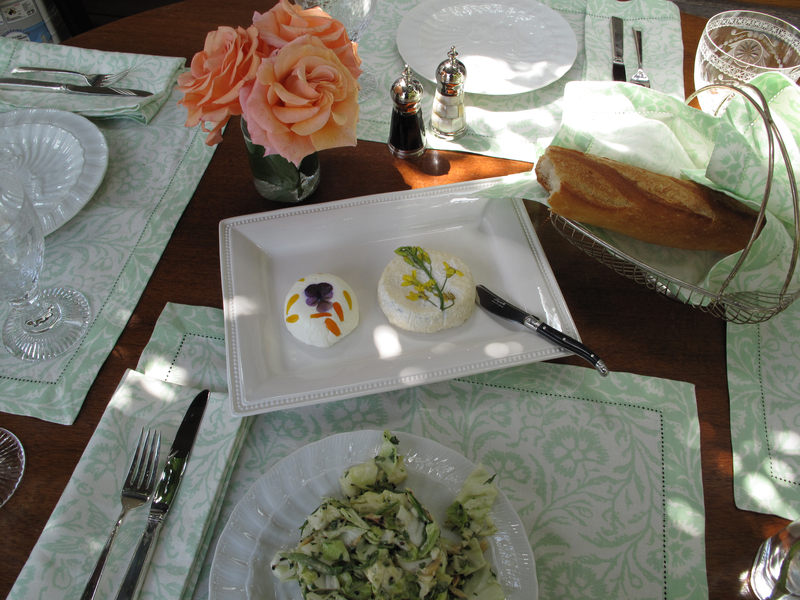 If, for nothing else, the fine pique linens! Salut! A story in pictures, and a few words. Some readers might remember my adoration for txacolina, a mineral-rich white wine from the Basque region of Spain. 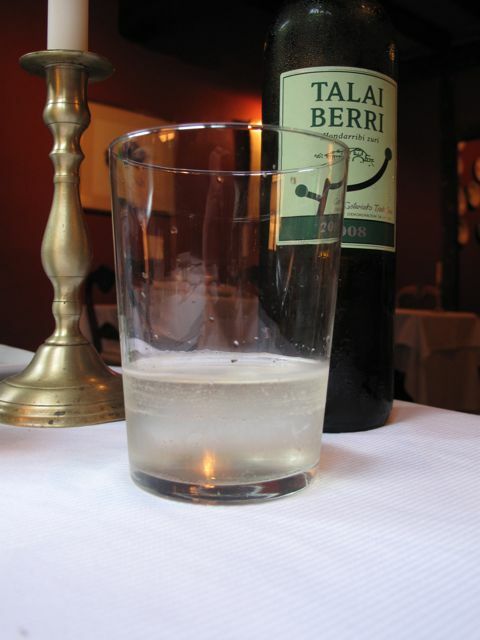 Urki’s Getariako Txakolina is a new discovery from Paul Marcus. It is a beautiful experience. The cork smelled of vanilla and flowers, and the txacolina was crisp and dry as expected, and citrus-y too, yet gentle (perhaps gentler than the Xarmant Txakolina), effervescent, but without any sour bite. All photographs taken with the Canon Powershot G10, an amazing camera I borrowed from I. Highly recommended. It makes everything and everyone look beautiful. 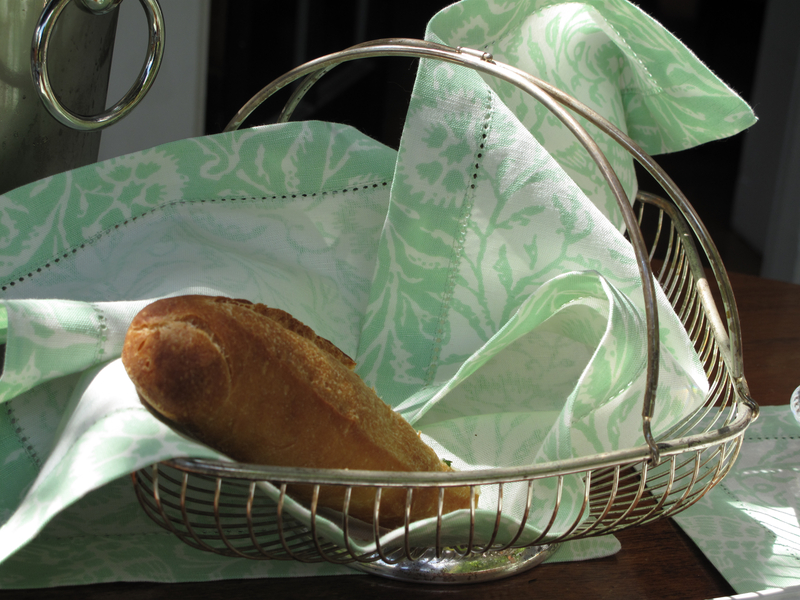 New linen placemats and napkins with hummingbird pattern from my mother. Towle “Old Lace” silver. Mottahedeh plats with raised swan design. 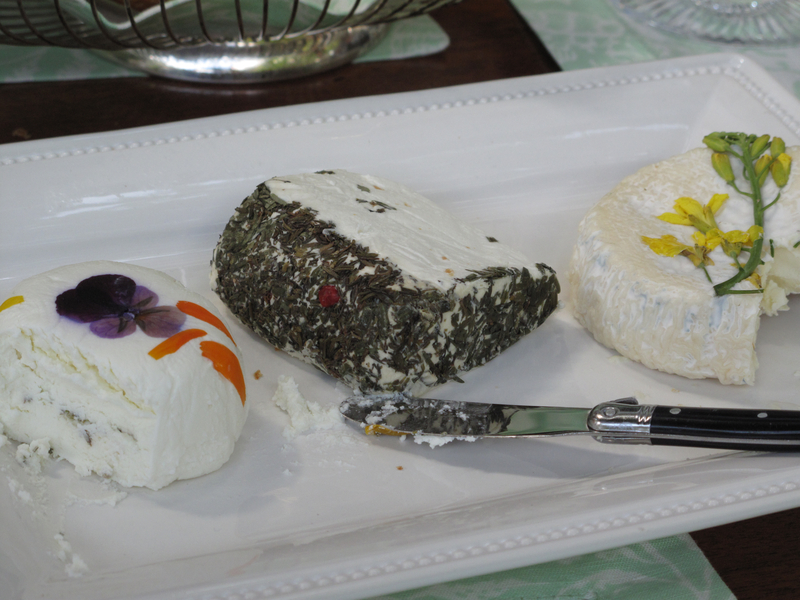 Laguiole cheese knife. Roses from my garden. Memorial Day is past and so is Easter, so we’re officially landed safely in white-shoe time of year. And while summer won’t start officially until the solstice on June 21st, why not celebrate with some white Car Shoes? I haven’t mentioned soothing in a while because I was afraid the term got overexposed, but summer is close, and it seems appropriate to resurrect it. Moccasins in general soothe. 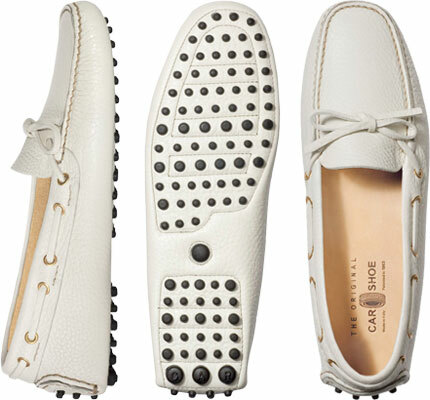 White Car Shoe moccasins? Super soothe. In the tradition of my dinner-for-one posts, here is the special meal I made for me last night. 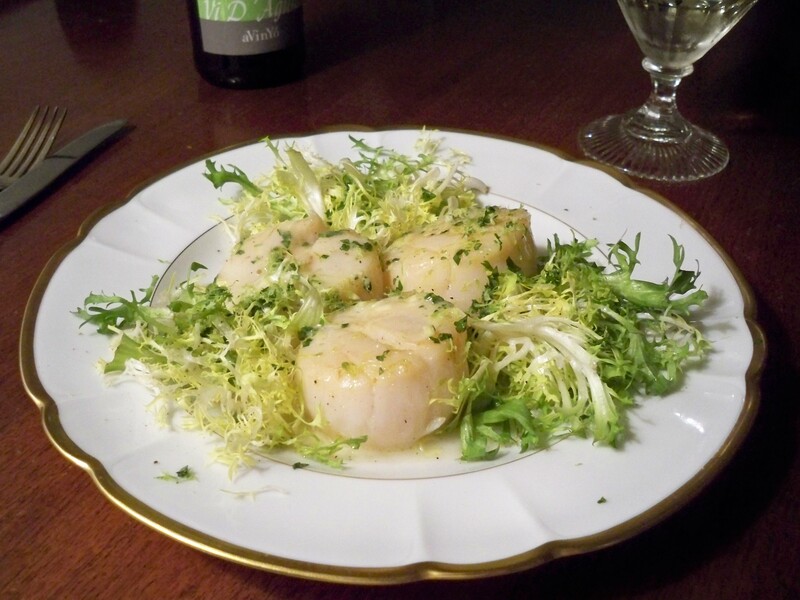 I cut the recipe down to three scallops (purchased at the fine Hapuku Fish Shop), took out my “good” china (Haviland) and served the scallops on a bed of frisee. 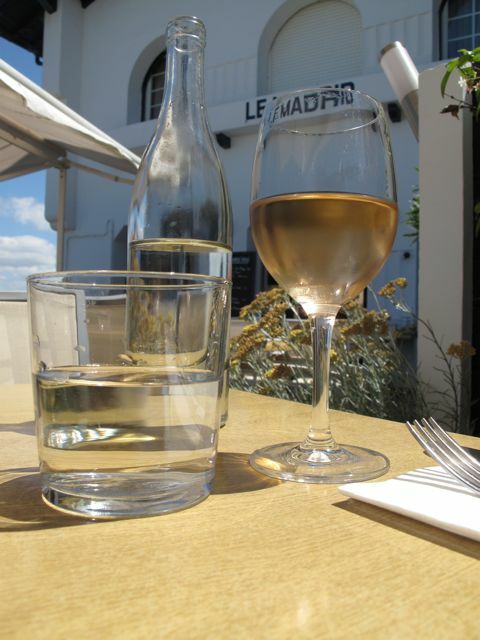 …a charming and slightly frizzante wine from the Penedes region of Spain located just outside of Barcelona. 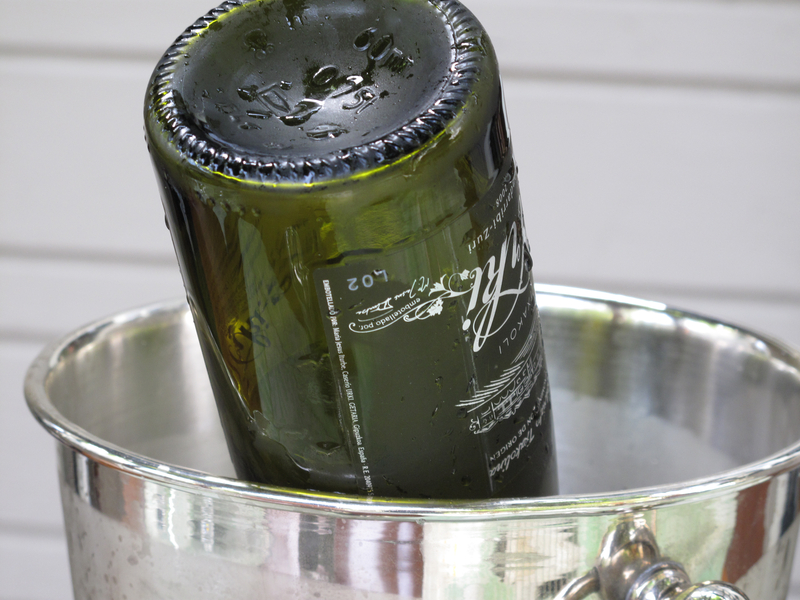 Its name means “wine with a prickle” and is intended as a summer thirst quencher. Other notes: this recipe is super easy, and you can up the healthiness factor by going light on the beurre blanc, as I did.